The success of many small businesses hinges on their data. Data loss or corruption can leave you crippled for days if not weeks. Disasters don’t follow any set schedule, and they’re certainly not convenient. They can hit your business when you least expect it. Not being prepared means risking a disaster happening before you’re ready for it. The following eight points will help to ensure that if a disaster does hit your business, you’re back up and running sooner rather than later. Write out a plan. While you may already have a great idea about what you’ll do if a server goes belly-up, or if a flood wipes out your offices, writing down a plan in advance will assist greatly in getting everything back up and running. This plan should, at the very least, detail the potential disasters themselves and the steps to take. More specifically, who should do what, and how. Detailing each step will also help you in budgeting for backup, maintenance, and disaster recovery. Automate backups. Never rely on a person for your backups. Human error itself is the leading cause of data loss. Someone could easily swap out the wrong backup tape, or fail to set up the backup to run properly. Automating your backup process will ensure that it goes off without a hitch. Store a backup offsite. As you might imagine, if anything happens to the data at your primary location, then having a recent copy backed up somewhere offsite, either on a separate server or storage device could potentially save your business. Onsite backups can be useful, too, but they won’t help you if your site directly suffers from a disaster, such as a flood, or anything manmade, such a malware or theft. Allow remote access to your network. If your office is ever inaccessible for any reason, you’ll benefit greatly from allowing your staff to log in and work remotely. Also, ensure that your IT staff has remote access to your network to counter any emergency or simply for routine maintenance. Create an image of your server. Offsite data backup will be great, but the server it resided on must be successfully restored before you’ll be able to do anything with the data. Servers these days have licenses tied to the many programs they use, such as Microsoft Office, your database, accounting software, etc. Even if your data is ready to be restored, without access to these programs, you won’t be able to do much with it. Best of all, an image will allow you to pick up right where you left off. You’ll keep all your preferences, settings, and any saved favorites. Compile network documentation. This is simply an outline of any software, data, systems and hardware used by your company’s network. With it, restoring your network will be faster, cheaper, and easier. This documentation will also help in keeping everything running smoothly on a daily basis by ensuring that your technicians can easily find the locations of various network features or hardware and their configurations. And in the event you have to file an insurance claim for what was lost, this documentation will detail everything perfectly. Maintain your system. Keep security up-to-date. Natural disasters are a big enough threat, but your small business is much more likely to be targeted by a virus, which may cause hours, if not days or weeks, of downtime. For this reason alone, it’s crucial to keep everything fully updated. Maintenance doesn’t just extend to your software, either. A faulty or degraded piece of hardware can also lead to data loss and downtime. The same goes for aging software. Make sure you replace old hardware and software to avoid being wiped out. Test regularly! 40% of companies test their disaster recovery plans only once annually. 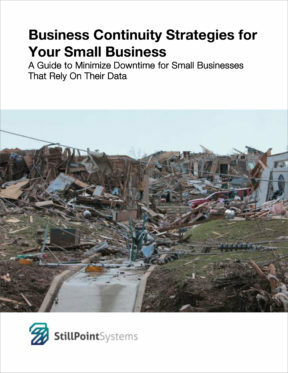 Another 28% rarely, if ever, test their disaster recovery plan (Source: State of Disaster Recovery initiative, Zetta). Setting up an exhaustive recovery plan and then not testing it is similar building a boat and then not testing it for any leaks. The last thing you want is to take your boat out to sea only for it to sink.